Now, you can invite mentors to securely access their match information and enter mentoring time directly into your database. No more hassle collecting mentoring activities from mentors and manually entering them into another system for reporting. Eliminating this work frees you up to grow your mentoring program. For mentors, it couldn't be easier. 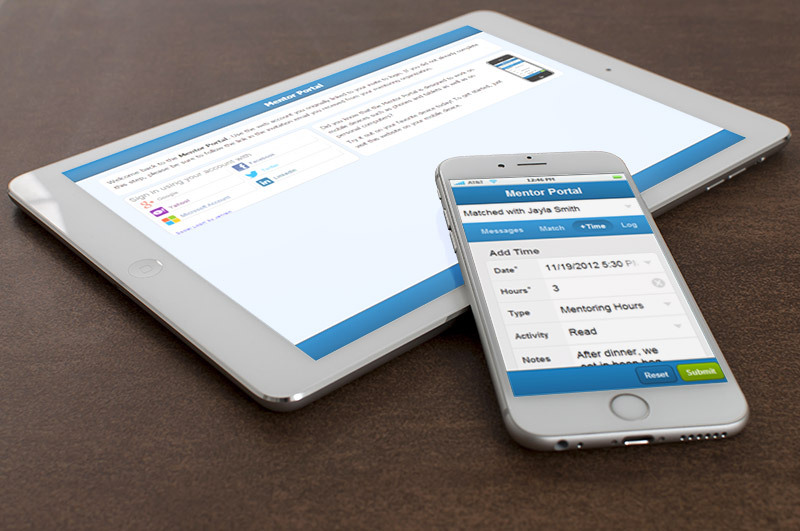 With the iPhone and Android compatible* Mentor Portal™ App, mentors can enter their mentoring hours anywhere and anytime. Also available is the Mentor Portal™ Website for access from personal computers. Send messages to mentors that don't get lost in their personal email inboxes. The Mentor Portal™ also displays survey invitations and all mentoring related emails sent from our software. Tracking and documenting mentor-mentee contacts including date, length and nature of each contact is a standard benchmark of an evidence-based mentoring program. Historically, this has been a time intensive process taking away valuable staff hours from other important work. With the Mentor Portal™ you can implement this benchmark without making sacrifices. Because survey invites are time sensitive, it is important to get mentors to complete surveys as quickly as possible. With the Mentor Portal™, mentors are reminded to complete the survey every time they log in to enter their mentoring hours. Mentors can simply click the link and take the survey right there on their phone or computer--survey results are automatically linked with their record in your database. The Survey Module helps you implement scientifically-tested relationship assessments and mentoring outcomes. *Compatible with iPhone, Android, Blackberry and Windows phones.